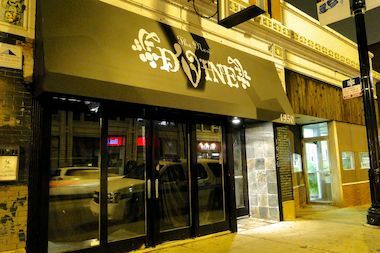 The New D'Vine at 1950 W. North Ave. in Wicker Park. WICKER PARK — A Wicker Park bar and restaurant is being cited for a litany of violations related to building safety, including allowing three times as many people inside as its capacity would hold, fights and allowing underage patrons inside. On Thursday, Cervante Floyd-Nicks, the manager of The New D'Vine, a lounge and restaurant at 1950 W. North Ave., appeared before Cook County Judge Pamela Hughes Gillepsie on the city's claims. But he didn't have a lawyer and the case was continued to Nov. 13. Floyd-Nicks said outside the hearing that he believes he is being unfairly targeted because he is black — as is his clientele. "Police come, harass us. One told me, 'I am going to shut you down.' I feel like I am being unfairly targeted because I am black," he said. Earlier this month, the city filed an emergency injunction to prohibit use and occupancy of the storefront at 1950 W. North Ave., alleging that The New D'Vine is a public nuisance. The motion identified Nicks as the manager with control over The New D'Vine and also named the building's owner and D'Vine's owner, Derek Gifford. City lawyers would not comment at the hearing. we can't comment on this pending litigation," John Holden, a spokesman for the city Law Department, said in an email. In a separate matter, Floyd-Nicks is also scheduled to attend a Deleterious Impact Public Nuisance Hearing on Nov. 6 for The New D'Vine, a spokeswoman for the City's Dept. of Business Affairs and Consumer Protection said. The spokeswoman would not immediately elaborate on the details of the public nuisance hearing. Gifford, who was not present in court, could not be reached for comment. Floyd-Nicks said has worked in the neighborhood for almost 10 years at previous inceptions of The New D'Vine, which was originally called D'Vine before briefly switching to a sports bar concept, Six Corners Bar. Last fall, D'Vine reopened as The New D'Vine after the sports bar did not work out, Floyd-Nicks said. "I love Wicker Park, it's the most diverse area and they are trying to weed out urban parties, they don't like hip hop music. It's ridiculous, sad, it's not the '60s anymore," Floyd-Nicks said. Floyd-Nicks, who works as a sixth grade teacher, said the primarily black clientele at The New D'Vine "are not riff raff." "These are college kids, fraternity and sorority girls, peaceful, no violence," Nicks said. Thursday's case was also amended at the request of city lawyer Lindsay Baker, who told Judge Gillepsie that Floyd-Nicks has agreed to disallow use of the rear door of the club as an entrance. Baker also said she would like a city fire Inspector to visit the property. According to the motion, which was given to DNAinfo Chicago by Floyd-Nicks, Chicago Police Department records show five incidents occurring at The New D'Vine during a 10-month period between Nov. 24, 2013 and Sept. 25 of this year. Last November, Chicago police observed the property "congested with patrons, making it difficult for officers to advance further than five feet within. According to police, a fire inspector counted 267 patrons when the license check revealed a maximum occupancy of 92. • On Feb. 26, Fire Department inspectors found 10 violations, the majority related to the building's basement kitchen. The club was cited for having an obstructed exit. • On Feb. 14, Nicks was ticketed for not calling 911 when there was a large fight in front of D'Vine. When asked about the fight, Floyd-Nicks said it occurred in front of Forever Yogurt at 1924 W. North Ave, about one-half block east. • On May 22, a police investigation revealed that many of the patrons in the club were under age 21. • On Sept. 24, D'Vine was ticketed for not having fire exit signs illuminated at the front or back entrances. • On Sept. 25, Floyd-Nicks was ticketed for not having a food handling and sanitation certificate after a worker in the basement kitchen who identified himself as the bar's cook was not able to provide a certificate. Floyd-Nicks said the man in the basement was a server and not a cook and that the server did not have the food prep certificate on him. He claims he was not issued any ticket for underage drinking in another incident. Regarding report of overcapacity: Floyd-Nicks said that the bar was not open to the public on Nov. 24 but was having a private party for a friend of his. "We were not open for business that night and there were not as many people as they say," he said. City Motion Against D'Vine, 1950 W. North Ave.